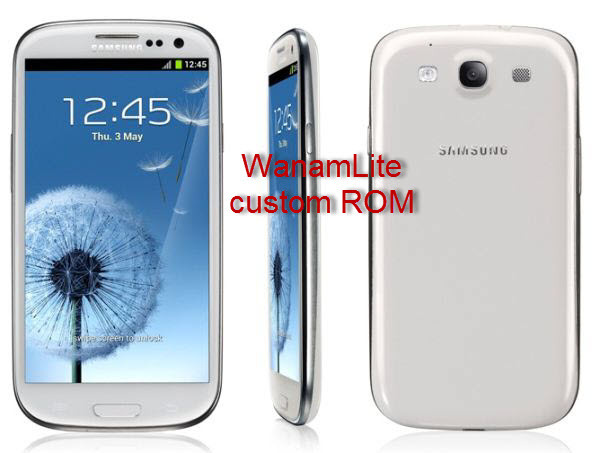 Wanam Lite custom ROM firmware is now arrived for Samsung Galaxy S3 GT I9300 android smartphone. The Wanam Lite custom ROM firmware is very popular for Samsung Galaxy SII smartphone and now it comes for S3 devices too. One of the best part of this firmware is that it comes with no different theme or say it comes with the same look as that of the official firmware released by Samsung. Please be informed that this is not an official firmware released by Samsung; it is a custom ROM firmware released by Wanam lite team. For applying this update, you will need to ensure that your Samsung Galaxy S3 GT I9300 device is on the rooted XXDLIB firmware with clockwork mod recovery flashed in it. You can check the firmware version from the path “Settings > About Phone” and to check on whether your phone is rooted or not, you can check the same from the app called “Root Checker” which can be downloaded from the Google Play Store. Before we proceed, let’s get started with the list of features along with pre requisites which one has to follow and then we will check on how to apply this update in Samsung Galaxy S3 GT I9300. It is highly recommended to take backup of all your precious data’s (i.e SMS, MMS, Contacts, APNs settings) which was present in your phone. Just in case, if your data gets corrupted or lost due to any reason you can recover them with the help of backup. Once you have created the backup, move them all to your computer/laptops so that they are safe. IMPORTANT : Don’t backup the data with the help of KIES as it does not detect the firmwares released other than in your country due to CSC code. Enable the USB Debugging in your Samsung Galaxy S3 GT I9300 by following the path “Settings > Applications > Development > USB debugging” and ensure that USB Debugging option is ticked. All the antivirus tools in your device must be turned OFF or uninstall because this may interrupt in the update process. So, once you have done all the above mentioned instructions you can now head over to the next step where we summed up a detailed tutorial on how to apply this firmware update in your Samsung Galaxy S3 GT I9300 android smartphone. First download the Wanam Lite custom ROM firmware package from here to your computer. Once downloaded, connect your device to the computer with the help of original USB cable and place the zip file in your Samsung Galaxy S3’s entered in the recovery mode. The recovery mode in Samsung Galaxy S3 GT I9300 can be entered by holding the Volume Up button + the Home key button (i.e the middle button). While holding these both buttons, turn ON your device. In the recovery mode, select “Wipe data/factory reset” & “Wipe Cache partition”. If the device starts normally, then you will need to retry the process of entering the device in the recovery mode. You can also enter the device in recovery mode via the ROM Manager app. Select “install zip from SD card” > “choose zip from internal SD card” and then choose the Wanam Lite custom ROM Firmware Package which you have placed in your phone. Once you have selected, it will take upto 5 minutes to apply the update. TIP : Just in case, your Samsung Galaxy S3 GT I9300 device gets into the boot loop sequence or say gets stuck in the welcome screen, just reinsert the battery and refollow the all above mentioned instructions. So there you go! you have successfully updated your Samsung Galaxy S3 GT I9300 device with Jellybean 4.1.1 WanamLite Custom ROM Firmware.